Need a shiny, eye-grabbing card? 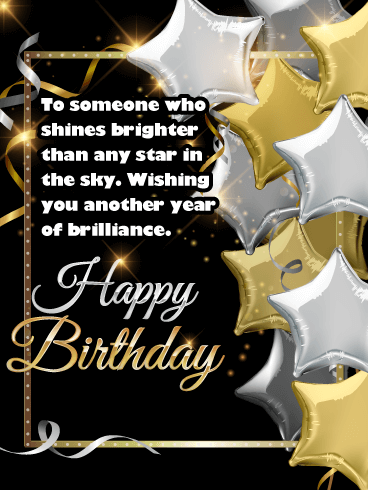 Send the Metallic Star Balloons Happy Birthday Wishes Card to catch everyone’s attention! 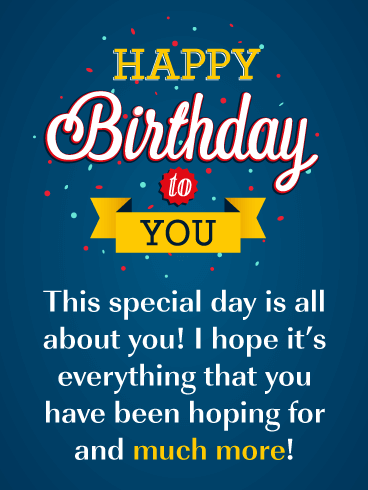 And most importantly, to capture the attention of the starry-eyed birthday guy or gal! They are a bright, shining presence in others’ lives, so let them know how much you admire that glow! 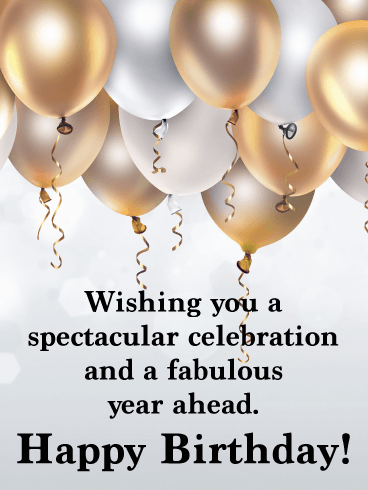 Wish them another year of brilliance with these gorgeous balloons! To someone who shines brighter than any star in the sky. Wishing you another year of brilliance. Donut worry, be happy! These sweet treat friends are here to wish someone a very Happy Birthday! 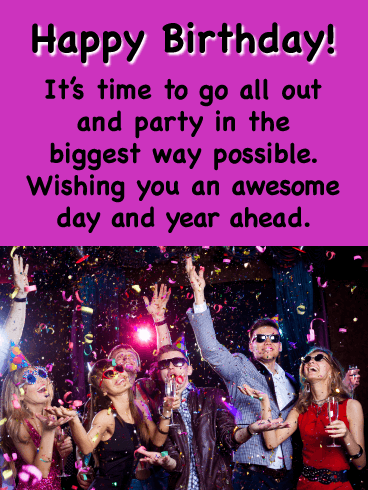 If you’re the type of person who likes making good-natured jokes at your friend’s expense- this card is for you! 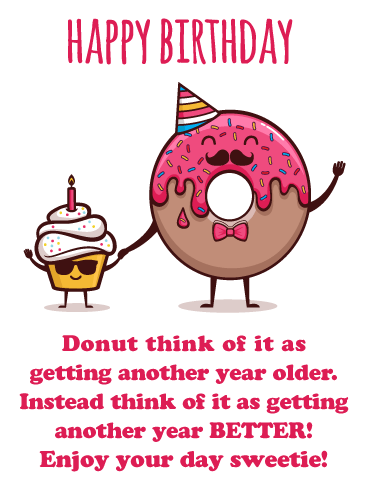 Send someone with a sense of humor the Donut Worry Funny Happy Birthday Card to let them know aging isn’t so bad, it just means you’re another year better! 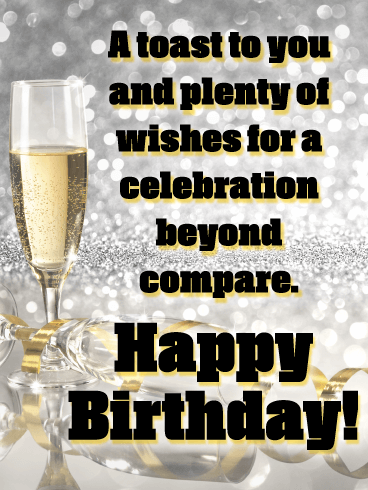 Raise a toast to somebody on their birthday with this card that’s full of the celebratory spirit! Champagne-filled glasses are lifted high in the air, with fun, colorful lights and a glittery gold background above. It’s the kind of greeting to put them in the mood for a party while letting them know how wonderful you think they are and the many wishes you’re sending their way. 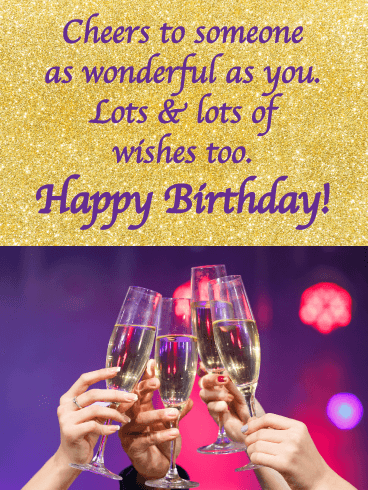 This sparkly card is simply beyond compare when it comes to wishing someone a happy birthday! A silver glittery background sets the tone for a celebration, and a single Champagne-filled glass lets you raise a toast to them in style. This is the kind of greeting they won’t soon forget! 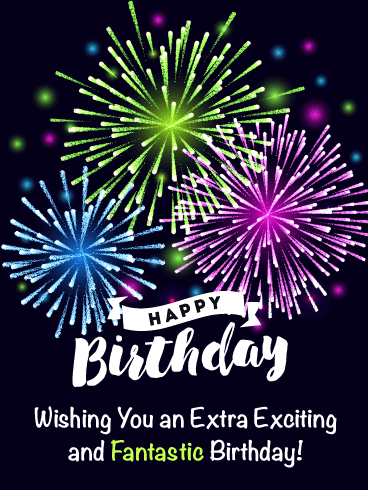 A colorful cake, topped with brightly lit “Happy Birthday” candles, is ready and waiting for someone to make a wish on their special celebration! And above, your words are just as sweet. Whether it’s a family member or friend, this fun & festive card is sure to be the best surprise of their day. 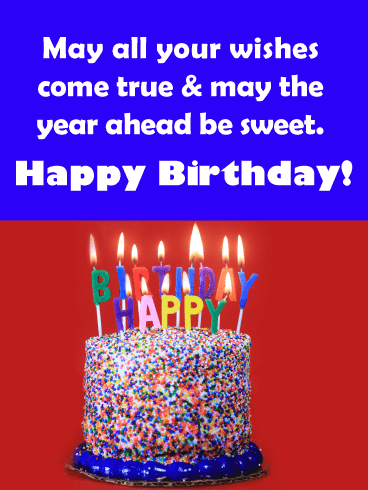 Need a sweet greeting to send someone on their birthday? This is it! 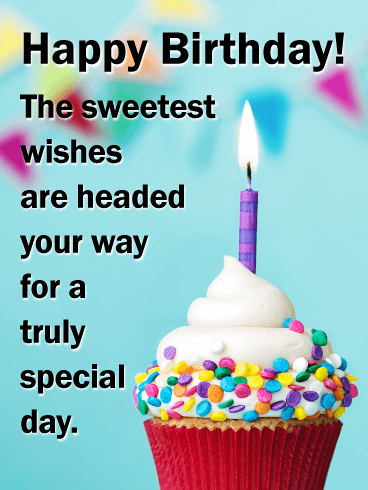 A cupcake is decorated with frosting and confetti sprinkles, then topped with a single candle, is ready for them to make a special wish. And your words will help to make their celebration even more memorable. Whether you’re near or far away this year, this card is one they’ll remember. This cute little monster is here to wish someone a big ol’ happy birthday…but first he has a few cracks about their age! 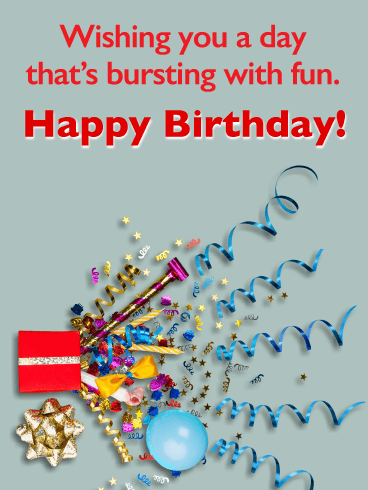 Send some laughs with the Silly Monster Funny Happy Birthday Card. 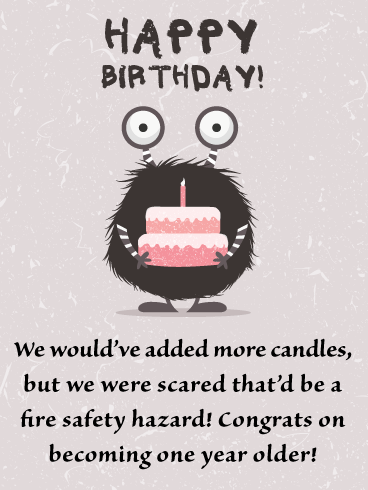 A slight twist on the classic joke about too many candles on a birthday cake being a fire safety hazard! 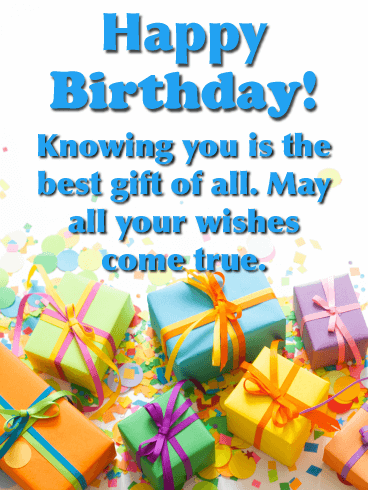 Wish someone special congratulations on becoming another year older.